In 3500 BC, the people of Sumer shook cream in a vertical churn. And butter was important enough to write about  records have been carved in stone. In the frieze below, to the right of the farm shed, temple staff milk a cow, and to the left they strain and stores the milk and make butter. Limestone and shale mosaic frieze framed in copper from the Ninhursag temple facade al-`Ubaid. ca. 2500 BCE. According to ancient references, butter was used not only in cooking, but in medicine, cosmetics and even sacrificial worship rituals. Through the centuries, butter became so well liked, it was almost a sin to eat it on certain days. From the 14th century onward in Europe, popes and people who liked butter on fast days had to buy special dispensations from the church. The ancient Hebrews referred to butter in the Old Testament, and as a result, they have been credited as the first developers of the art of butter making. Traditional Moroccan cous cous, seasoned with smen. Berber farmers in southern Morocco bury a tightly-sealed pot of smen on the day of a daughters birth, unearthing it years later to flavor the couscous served on her wedding day. 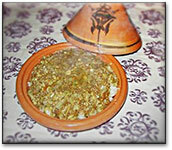 Moroccan terda, a lentil & bean stew, flavored with smen, and served over stale bread. Smen (semneh, beurre ranci) is a traditional butter-based cooking oil made from sheep and goat milk. Preserved butter, with its deep, pungent aroma and distinctive flavor, enhances many of Morocco's savory dishes, especially couscous. It is an aged butter similar to Asian ghee, and is a prized flavoring ingredient in Moroccan dishes. In Morocco, smen (or sman) is still a delicacy. It is made by kneading butter with various decoctions of herbs, cinnamon, and other spices; the mixture is then cooked, salted, and strained like ghee. It is poured into jugs, tightly stoppered, and buried in the ground for months, sometimes years. Stores of the precious stuff are saved for special feasts. The smell is considered especially magnificent: a particularly aged pot of the family smen may be brought out of the cellars for honoured guests to sniff. The smen represents the riches of the house. The necessity of "doctoring" a perishable substance in order to save it in hot weather is in this manner turned into a gastronomic triumph, and hedged about with tradition and prestige. Other versions of clarified butter, called samna by non-Moroccan Arabs, are to be found throughout the Middle East. In Lebanon, samneh is made from butter that has been boiled until the fat in the pan is as transparent as a tear (dam'at el-eyn). It is then taken off the heat and left to settle before being carefully strained through a fine sieve into sealed containers where it will keep for a year or more. Ethiopia has a spiced version, nit'r k'ibe. Read more about making ghee. In a medium saucepan, melt the butter over low heat. Wrap the oregano in a small piece of cheesecloth. Tie the sachet with cotton string, and set in the butter. Simmer until the butter separates into a clear, golden liquid and a milky sediment, 25 to 30 minutes. Carefully pour off the golden liquid (clarified butter), and strain through a piece of clean, fine muslin. Discard the milky sediment and oregano sachet. Transfer to a hot sterilized glass jar. Add the salt and mix until dissolved. Cover and let stand in a cool place until the mixture becomes pungent, 1 to 2 weeks. Drain any liquid from the jar and refrigerate the butter. Use within 6 months.